I will post with you Saturday afternoon! Can't wait to read your thoughts, Openhome! has Alice read the classics much? I think she picked them up one time or another. Some good character driven books to better understand the human mind, since she can't remember human life. I don't know if she would be as interested in them as Bella, but she must have read them at least once right. Openhome wrote: I can totally see Alice loving corny romances and detective novels. Now I can see that too, especially the detective novels. Maybe some chick lits too, like the Shopaholic series. Maybe she learned something from that, although the Cullens will probably never have problems with money. smitten_by_twilight wrote: She had plenty of time to read while waiting for Jasper to show up in Philadelphia, although she may have stayed busy otherwise. That's a pretty good question too. What did Alice do when she was waiting around for Jasper? You think she met some other vampires or tried to interact with humans? I don't think she is capable of hiding away somewhere and do nothing. Sorry for the double post but this is some pretty exciting news, it deserves it's own post! Just saw this and especially this picture has got me jumping in my seat! It's Alice in her bathroom doing the pre-wedding make-over on Bella! (Or at least I am pretty sure it is) Just like we wished for a couple of pages back. I'm so excited we will get to see Alice's bathroom! I hope it's going to be a really lovely scene between Alice and Bella, where we finally get to see there relationship that I've been missing in the previous movies. I'm loving the hair also. Not sure if it is another wig or if they just styled it differently for the wedding scene, but it looks so good imo! It's not so spikey and sticking out in every direction. I like what she's wearing too, although I had something else in mind for her bridesmaid dress. But it could also be something like a bathrobe and she will put her dress on later? Isn't that what happens in the book: Alice leaving Bella alone for a few seconds to get dressed and Bella starts to freak out when she's alone in the room in her wedding dress? Sorry for the long story here, but I could go on for hours about this one picture alone! Can you tell I'm super excited about this!? Judging from the stills we've been given so far, I'm thinking this might become my favorite movie of the series! Unless BD2 is even better. I have a feeling I'm going to love love love Bill Condon. Suzan wrote: I'm so excited we will get to see Alice's bathroom! I completely forgot about Alice's enormous bathroom until I read that! I agree with your guess that Alice might be wearing a bathrobe. She may not have to worry about sweating in her dress, but Bella might accidentally damage it, or it might wrinkle while she was spending all day making over Bella. I'm a little disappointed in her hair in this shot, as I was really looking forward to tiny pincurls framing her face, 20's style. But seeing Alice's bathroom for the first time will be like seeing the Honeydukes sweetshop (HP and the Prisoner of Azkaban), except girlier! What kind of a fever pitch will the filmmakers have us in by November! That's a pretty good question too. On the topic of reading and otherwise staying busy, I'm really enjoying Openhome's Alice fanfiction (Singularity at fanfiction.net). Very readable, IMHO. Great way to keep my mind busy while waiting for November. Hi there everyone! Up and at 'em, Party Planners! I’m here to invite all of you to Edward’s 110th Birthday Party, and you guys need to do something wonderful for it! 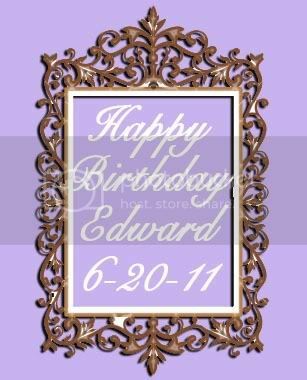 We Cullens are opening a Birthday thread for him on the 20th, and we would LOVE for all of you to stop by and wish Edward a Happy Birthday with us! Thanks for the invite! Always an honor to have you here. Maybe we can also do something collective as the party planning experts. Like an extra special surprise. Maybe the ultimate birthday cake or something? Hahahaha! The perfect cake would be SO much fun! We could have lions and tigers and bears sticking out of it! I seriously just sat for about two minutes thinking: Why would you want lions and tigers and bears sticking out of a cake? Duh, Suzan! They don't eat cake! *faceplam* That just totally silpped my mind. But I like your idea, Openhome. We should totally do that, haha. Suzan wrote: Maybe the ultimate birthday cake or something? Openhome wrote: We could have lions and tigers and bears sticking out of it! ha ha! Alice fans, thinking alike! I'm thinking cake themes, like local favorites (mt lion, polar bears) versus new and exotic flavors (African lion, cheetah), possibly accompanied by plane tickets for Edward and Bella. Would they want Renesmee, and thus Jacob, to come along, or have a second honeymoon? The cake would merely be symbolic ... how about a drawing that kind of shows the predators all mashed together in a cake outline, do you know what I mean? This could be a lot of fun!